I’m attending the Humanities Intensive Learning + Teaching courses at Maryland Institute for Technology in the Humanities, #hilt2014, for the second year running. Last year was Matt Jocker’s excellent course on R and this year I’m attending Elijah Meek’s course on Network Analysis and Visualisation. The first day we covered network basics and why you might want to actually carry out visualisation across graphs – and what the hell are graphs anyway? Graphs, put simply, are a collection of things and connections between those things. Now that I’ve killed every mathematician reading this blog, let’s continue. I’ve done a lot of work on this before in the Internet Topology Zoo but it’s now looking like analysis of large-scale online education is something I have to get good at, so it seemed a great opportunity to come and see how the DH community do this and get access to some mature processes and tools. Why is this important as a visualisation (or representation, thanks, Elijah) target? Because pictures tell stories well and we can use this to drive argument and make change. Let’s consider the Medici, the family who dominated Florence from the 1400s to the 18th century. While not being the most wealthy and powerful families at the outset, they were (by marriage and arrangements) one of the most well connected families. 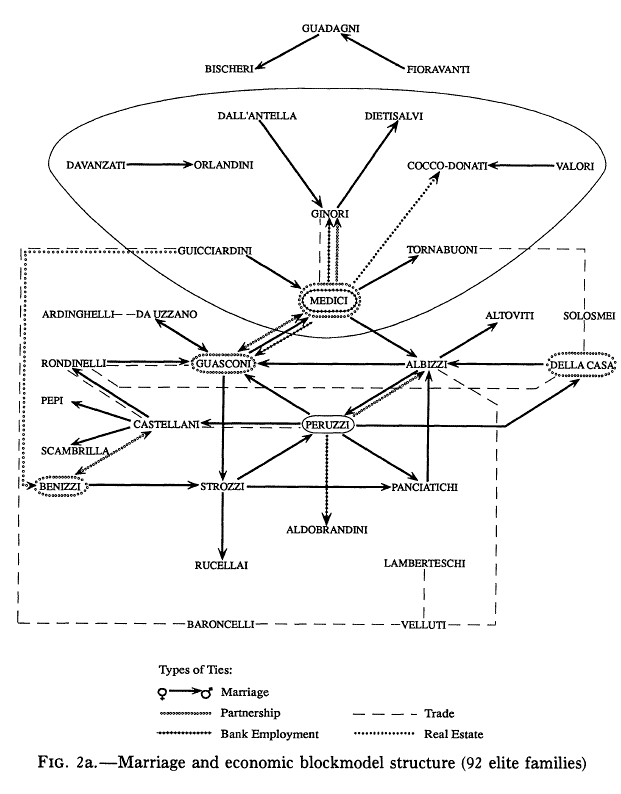 In fact, the connections from some groups of families to other families had to go through the Medicis – which made them more important because of their role in the network. In graphs of the Internet, everything is connected to the Internet by definition, so we don’t have any isolated elements. (We do have networks that don’t connect to the Internet, such as super-secret defence networks and some power stations – not as many as there used to be – but we’re interested in the Internet.) It is possible to analyse communities and show ways that some people/entities/organisations are not connected to each other. Sometimes they form disconnected clusters, sometimes they sit by themselves, and this is where my interest comes in, because we can use this to analyse student behaviour as a learning community. A student who enrols in your course is notionally part of your community but this is an administrative view of the network. It’s only when they take part in any learning and teaching activity that they actually become part of the learning community. Suddenly all of the students in your network can have a range of different types of connection, which is a good start to finding categories to talk about behaviour in large on-line courses, because now we can easily separate enrolment from attendance, attendance from viewing, viewing from participation in discussion, and discussion from submission of work. I hope to have a good look into this to find some nice (convenient) mathematical descriptions of the now defunct cMOOC/xMOOC distinction and how we can encourage behaviour to get students to form robust learning networks. As we can see from the Medicis, the Medicis used their position in order to gain power – it wasn’t in their interests to form additional connections to make the network resilient if they fell on hard times. However, learning networks don’t want a central point that can fail (central points of failure are to be avoided in most contexts!) and this is why a learning community is so important. If students are connected to many other students and their lecturing staff, then the chances of one relationship (connection) failing causing the whole network to fail is very low. Some people are, naturally, very important in a learning community: we’d hope that instructors would be, tutors would be, and key students who handle discussions or explanations also would be. However, if we have very few of these important people, then everyone else is depending upon this small number to stay connected and this puts a lot of stress on these people and makes it easy for your network to fall apart. I’ll talk more about this tomorrow and hit you with you some definitions!